Hall of Fame quarterback Troy Aikman is leading a new team: United Way of Metropolitan Dallas. Announcing partnerships with Charity Network and world-renowned business leaders, the #UniteWithTroy campaign year will feature a first-of-its-kind digital fundraising strategy sure to be one for the record books. Proceeds raised benefit the work of United Way of Metropolitan Dallas, committed to ensuring all in North Texas have the opportunity to get a quality education, a stable job and lead healthy lives. The organization’s 93rd annual campaign, #UniteWithTroy will engage long-standing corporate, civic and philanthropic relationships, while establishing new ones through innovative digital fundraising strategies. Dallas billionaire entrepreneur Todd Wagner’s Charity Network and United Way are teaming up, leveraging Aikman’s 2017-18 campaign chairmanship to offer unique experiences through online fundraising channels Charitybuzz and Prizeo. Prizeo provides an opportunity for Aikman to engage with fans and supporters, allowing them to donate as little as $10 to be entered for a chance to win dinner with the most famous trio in NFL history: Aikman, Emmitt Smith and Michael Irvin. In addition to the grand prize, fans can win other rewards for entering, including a signed football, and limited-edition merchandise. To enter to win, fans can visit www.unitewithtroy.org today through Dec. 31, 2017. Aikman and United Way are also utilizing Charity Network’s Charitybuzz online auction site, which features once-in-a-lifetime luxury and celebrity experiences and attracts a community of 250,000 bidders around the world. 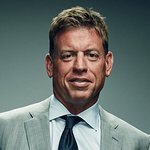 Through Charitybuzz, Aikman will invite fans to bid on exclusive opportunities to join him in select cities for a cocktail party the Friday night before select NFL games, along with chances to be on the sideline during pre-game and then meet him and Joe Buck in the broadcast booth. Games featured include Cowboys at Broncos (9/17), Giants at Eagles (9/24), Packers at Cowboys (10/8), Packers at Vikings (10/15), and Cowboys at Redskins (10/29). Flights and hotel accommodations are not included with these packages. Aikman and his former teammates will not be the only ones offering exclusive experiences. Business and philanthropic leaders will donate an hour or more of their time in efforts to raise more money for United Way. Every global CEO who has served as United Way annual campaign chair since 2011, including Randall L. Stephenson, Chairman and CEO of AT&T; Rich Templeton, Chairman, President and CEO of Texas Instruments; Thomas J. Falk, Chairman and CEO of Kimberly-Clark Corporation; Tom Greco, President and CEO of Advance Auto Parts and former CEO of Frito-Lay North America; David T. Seaton, Chairman and CEO of Fluor Corporation; and Mark Rohr, Chairman and CEO of Celanese Corporation, are committed to auction off a power lunch or breakfast meeting through the annual Charitybuzz Entrepreneur Auction this Fall. Meetings with entrepreneurs and business leaders have proven to be one of the most successful fundraising categories on Charitybuzz; for example, coffee with Tim Cook, Chairman and CEO of Apple, recently sold for more than $600,000. The United Way has also produced three 30-second Public Service Announcement spots featuring Aikman, aimed at communicating United Way’s mission and message to a greater national audience. This marks the first time United Way of Metropolitan Dallas has undertaken such a comprehensive television campaign. To learn more about #UniteWithTroy, visit UniteWithTroy.org.